Download this guide to access this vital Blackbaud software information on the go! Blackbaud CRM is Blackbaud's largest-scale constituent relationship management solution available, with robust and highly expansive data management options for nonprofits with complex needs. Because Blackbaud CRM is so powerful, it's only intended for enterprise-level nonprofits who can benefit from a customizable end-to-end solution. If you choose Blackbaud CRM as your software, make sure you have a plan in place for implementation, customization, and training. Unlike other products in the Blackbaud family, Blackbaud CRM is not an out-of-the-box solution that can be put in place overnight. In fact, it's highly recommended that you work with an experienced Blackbaud partner who can help you build out a solution that uniquely fits your needs on every level. You’re an established, enterprise nonprofit with complex needs and a large amount of data to manage. You’re prepared to spend time (and money) implementing your new CRM with the help of a consultant. You need a highly customizable CRM solution and have a plan for how you’ll adapt your CRM to meet your needs. Learn More About Implementing Blackbaud CRM at Your Nonprofit! Both powerful and versatile, Raiser’s Edge is one of the most widely-used Blackbaud products—and for good reason! Raiser’s Edge (including its newest iteration, Raiser’s Edge NXT) is a comprehensive CRM and fundraising software solution that’s scalable enough to fit a mix of nonprofit needs. If you’ve outgrown your smaller donor management solutions, are combining a variety of piecemeal software, or are looking for a scalable solution that’s more manageable than Blackbaud CRM, Raiser’s Edge might be an ideal fit for you. Raiser’s Edge centralizes all donor data, fundraising campaigns, and communication tools into one highly functional (yet user-friendly) software. With its robust set of features, you’ll be able to unlock your nonprofit’s full fundraising potential while streamlining your day-to-day operations. You’re in need of a CRM solution that can also provide a wide range of fundraising tools and outreach features. You need an out-of-the-box solution that doesn’t require the extensive implementation of a larger CRM (such as Blackbaud CRM). You’re a growing organization in search of a CRM and fundraising software solution that can be expanded over time. 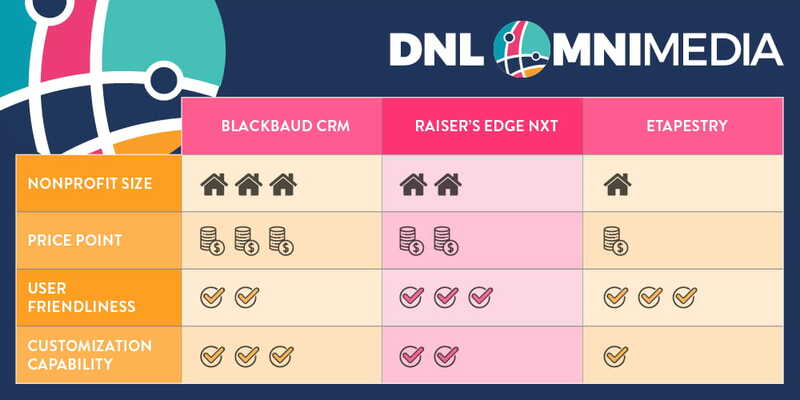 Learn how Team DNL can help you maximize your Blackbaud software solution! For Salesforce users looking to harness the power of Blackbaud’s nonprofit expertise, Luminate CRM can be a game-changer. This nonprofit-specific CRM can extend the functionality of your Salesforce system and equip your organization with all of the fundraising and donor management tools you need to succeed. Because it was built for Salesforce, Luminate CRM is well-suited for larger organizations with a flexible budget and a need for a truly comprehensive constituent relationship management solution. While highly customizable, Luminate CRM has more extensive implementation process than some other Blackbaud offerings (such as Raiser’s Edge). That being the case, you’ll need to account for elements such as customization, training, and consultation as you map out your CRM implementation timeline and budget. Your organization already uses Salesforce to manage constituent data. You’re in need of robust CRM and fundraising campaign management software to meet a range of goals and needs. You have room in your budget and timeline for implementation (with the help of a nonprofit technology consultant). Find Out Even More About Luminate CRM by Reading This Post. Just getting started with online fundraising and supporter data management? You don’t have to miss out on the power of Blackbaud software; just look to eTapestry! eTapestry was built to give small or growing nonprofits access to an assortment of must-have fundraising features and donor management tools—without breaking the bank, of course. Because it was built for nonprofits with fairly basic needs and goals, eTapestry doesn’t offer the extensive customization options that some other Blackbaud software does. On the flip side, it’s a great software choice for organizations who want to get up and running quickly with easy-to-use, easy-to-implement software. Plus, eTapestry is simple enough that nonprofits with limited CRM experience don’t spend all of their time learning to navigate their software when they could be out engaging with donors. You need to expand your donor management strategy beyond spreadsheets but aren’t ready for a large-scale CRM solution. Your nonprofit prioritizes affordability and needs a CRM solution that can fit into a more restricted budget. Your fundraising goals are simple enough that a straightforward CRM and fundraising software solution can accommodate most of your needs. See Even More Popular Blackbaud Software Choices! Luminate Online encompasses far more than just Luminate CRM. See how the entire suite of Luminate products can enhance your fundraising efforts. Read the Nonprofit’s Guide to Luminate Online! If you’re implementing Raiser’s Edge at your nonprofit, you’ll need to be properly trained. Learn about your training options by reading this thorough post. Discover the top Raiser’s Edge training options! While not a CRM, TeamRaiser—Blackbaud’s peer-to-peer fundraising solution—can be an important part of your technology strategy. Learn more about TeamRaiser configurations!